Precipitation - Make it Rain! Raining Rainbows (shaving cream and food coloring) - A Bit of This and a Bit of That! Transpiration - Collect Plant Sweat! 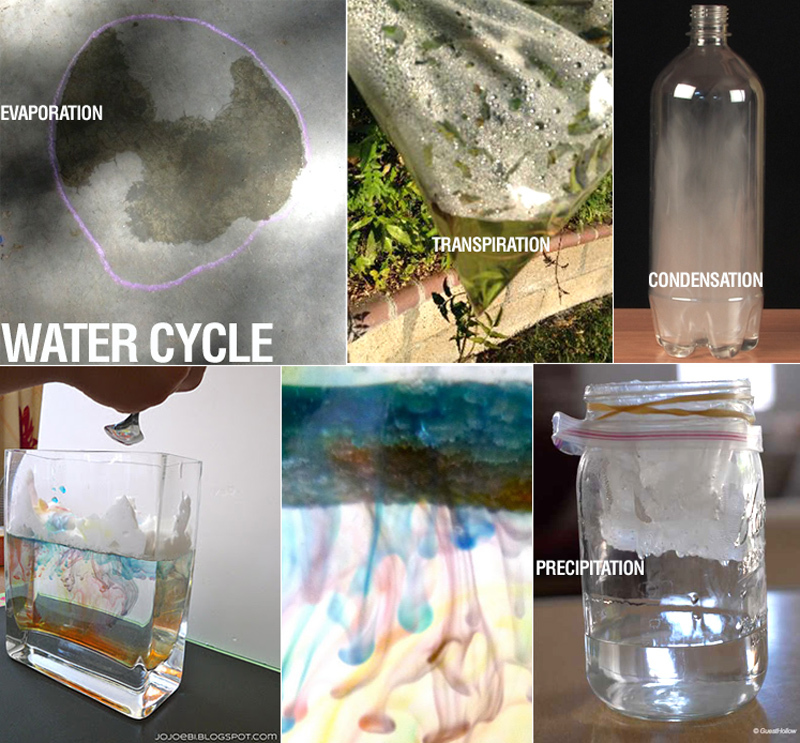 Learn about transpiration through this hands on experiment from Weird Science Kids. By tying a large baggie around a plant's leaves on a super hot, sunny day, you will demonstrate how transpiration is part of the water cycle. Pour the water from the plant into a measuring cup. Kids use their measuring skills to figure out how much water the plant produced. Click here for full instructions! Save your water for the puddle experiment below! Also, check out Parents.com to see how to conduct this experiment with a patch of grass and a jar! Evaporation - Watch a Puddle! Science With Me conducted a puddle experiment to teach kids about evaporation! Pour water on the pavement in a sunny spot. Then, draw a line around it with sidewalk chalk. Let it sit, then check up on it later. What happened? The water evaporated! Condensation - Create a cloud!